Omega is a large android, standing 15 feet tall. Enhanced Abilities: Omega has super human strength, endurance and durability. Body Armour: Omega is made from an alloy that provides a high degree of protection from physical and energy attacks. Size Manipulation: Omega is a large android, standing 15 feet tall. When attacked by Inhumans who had any animosity toward the Alpha Primitives, Omega channelled that energy into increasing his size. Resistances: Omega has a high degree of resistance to fire. Omega is a giant android created by the Inhuman, Maximus, to lead a rebellion of the Alpha Primitives. Maximus was able to harness all of the secret guilt of the Inhumans over the enslavement of the Alpha Primitives. 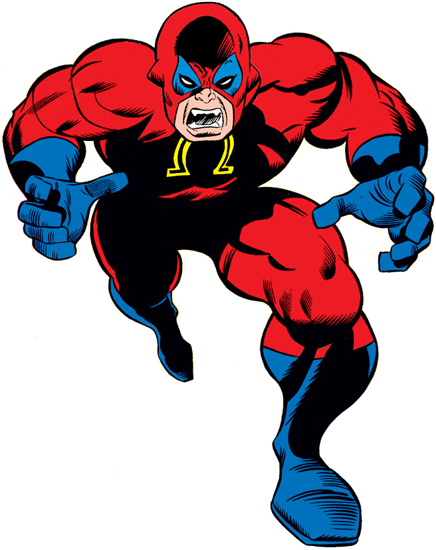 Creating Omega with this power, he used Omega to lead an assault on the Inhumans, causing an open war in Great Refuge.